It’s no secret that social media sites are dramatically changing the way we live and conduct our lives online. But, what this means to, and how this involves women is commonly overlooked. Perhaps surprisingly, women are online and interacting on social sites just as much — if not, more — than their male counterparts. In fact, more than half of all American women participate in social media at least once a week, with, of course, younger women using social sites the most. 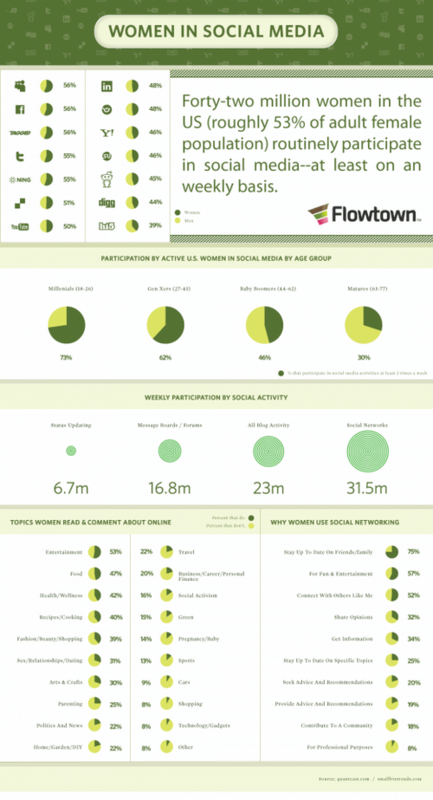 The following is a graphic that takes a look at what sites women are using, as well as how much and why women are participating in social media.